There is some project that have we do, base on natural science and anthropogenic sciences. Siberut Sustainable Ecosystems: Towards synergy between the public and government | In collaboration with Center for Applied Geography Research (PPGT) – UI, this 3-year research project started in 2012 aims to determine the socio-economic condition of the community and participatory mapping of land use. Ecosystem Service – Supporting the Forest, Supporting the People: Evaluating ecosystem services of forest edge for park boundary support system | Birds and bats are provider of ecosystem services through their pollination and seed dispersal activities. This research was conducted in Bukit Barisan Selatan National Park in 2012 to understand the biodiversity provider of ecosystem service around the park boundary. This research was funded by Rufford Small Grants for Nature. Analysis of impacts of climate change and extreme weather of forest productivity and phenology | Learning from Dipterocarpaceae — a family of trees composing the emergent trees of lowland dipterocarp forest — a collaboration research was initiated in 2012 with Pusat Penelitian Perubahan Iklim dan Kebijakan (Puspijak) Forestry Research and Development Agency (FORDA – Ministry of Forestry). This research is conducted in Bukit Barisan Selatan National Park, Lampung, to understand the dynamics of lowland dipterocarp forest towards climate change through the phenology of Dipterocarpaceae trees and to determine the adaptation scheme. The Rainforest Standard Protected Area CreditTM (RFS PACTM) in Bali Barat National Park | The demonstration project of The Rainforest Standard Protected Area CreditTM was led by Asri Adyati Dwiyahreni, M.Sc. from RCCC UI. The project was a collaboration between RCCC UI and Center for Environment, Economy, and Society Columbia University (CEES CU). The Rainforest StandardTM is a carbon credit standard which fully integrates the requirements and protocols for carbon counting, social-economy impact, and biodiversity. The main goal is to reduces forest loss from logging and integrate available practices to preserve biodiversity and increase social-economic value. The collected data will be used as benchmark for future monitoring and to provide base knowledge for best practices in national park management plan. Soil Quality Assessment for Biomass Production in Karawang, West Java | The assessment was in cooperation with BPLH Karawang, West Java and aimed to get the most current land-use status and its degradation through direct analysis and sampling from the field. The output is hoped to provide accurate information on soil and wetlands for up-to-date status mapping and natural resource management. Action Plan for Adaptation and Climate Change Mitigation in Karawang, West Java | The continued cooperation with BPLH Karawang, West Java aimed to establish a guide for mitigation and adaptation in climate change. The output is for the guide to provide references for policymakers in Karawang. Restore Ecotourism Functions Pancoran Mas Forest-Park, Depok | Pancoran Masis one of the oldest forest sanctuary (cagar alam), which was establishedsince the Dutch East Indies. Its status has then changed to Taman Hutan Raya (Tahura) and established to collect several plant and wildlife for educational purpose. The recent condition of Tahura is unmanaged, making its initial function for education (including for ecotourism) ineffective. Several steps was done to restore Tahura Pancoran Mas as an ecotourism site. First, coordination with Dinas Lingkungan Hidup & Kebersihan (BLH) Depok. 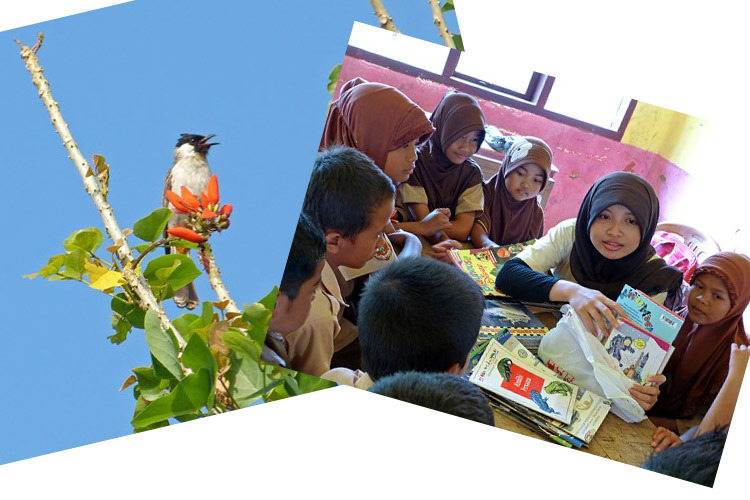 Second, publishing the book of Biodiversity in Tahura. Third, socialization on Tahura with local youth communities. Fourth, creating documentation and publication. Potential of Biodiversity as indicator Climate Change | A grant writing project to publish a SCOPUS-indexed article for students. Three students, Destario Metusala, Roliska Virgo Dinanti, and Endah Septi Fauzi, each wrote scientific publications that was published in Zootaxa and Biodiversity journal. Identification of Indicator Species to Indicate Environmental Change on Bawean Island, Indonesia | Survey and inventory data for herpetofauna, lepidoptera, and soil herbsare still lacking. As an effort to close the gap, survey has been done in Bawean Island, which resulted in the finding of 41 species of lepidoptera, 18 species of herpetofauna, and 24 species of soil herbs. Survey of Javan Surili (Presbytis comata) in West Java and Capacity Building for Primate Field Research | Javan Surili is an endemic primate species only found in West Java and small parts of Central Java. Survey of Javan Surili was done in three national park in West Java: Mount Halimun-Salak National Park, Mount Ciremai National Park, and Mount Gede-Pangrango National Park. Capacity building activities, which included lectures and field study in Mount Halimun Salak, was done for university students in Java. .
Survey of Herpetofauna in Peatland Ecosystem in Zamrud National Park, Indonesia: Determining the Impacts of Climate Change | Herpetofauna, a non-taxonomic group which includes reptiles and amphibians, serves as an indicator for changes in the environment. This research was done to survey herpetofauna in the Peatland Ecosystem located in Zamrud National Park.